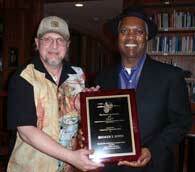 SAI Co-Director Nick Toth presents Dr. Booker T. Jones with the SAI Craftsmanship Award. Dr. Booker T. Jones in the center of SAI staff, from left to right: Kathy Schick, Nick Toth, Reina Wong, Tom Schoenemann, and Sharon Grubb. 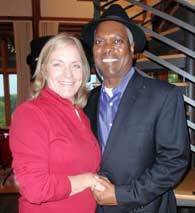 Dr. Booker T. Jones expressed a special thank you to those in attendance at the SAI evening gathering in his honor. Dr. Booker T. Jones cuts the cake with an officer's sword from the Civil War. Nick joked that he would never clean the sword. The highlight of the evening was Dr. Booker T. Jones's performances on The Stone Age Institute's brand new Hammond organ. Dr. Booker T. Jones began the set with "Green Onions," the signature song of Booker T. and the MGs. Dr. Jones' rendition of Bob Dylan's "Knockin' on Heaven's Door" was soulful - an incredible performance. Accompanying Dr. Jones: the band Built for Comfort, consisting of Dave Baas on guitar, Tim O'Malley on guitar, John Orie Stith on bass, and Paul Karaffa on drums. The bouncy "Hip Hug Her" was also included. Accompanying Dr. Jones: Dave Baas on guitar, Tim O'Malley on guitar, John Orie Stith on bass, and Paul Karaffa on drums. Dr. Booker T. Jones accompanied Dave Baas and his band, Built for Comfort, on the Hammond organ for Bob Dylan's "When I Paint My Masterpiece." 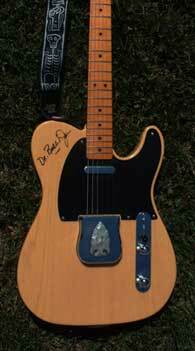 The second performance of "Green Onions" ended Dr. Jones' live concert. For this "Green Onions" performance, Dr. Jones's Hammond organ was accompanied by Nicholas Toth on guitar, Tim O'Malley on guitar, John Orie Stith on bass, Julian Gass on drums, Robert Port on congas, and Tom Schoenemann on cabasa. Dr. Booker T. Jones spoke candidly about playing the older Hammond organs.